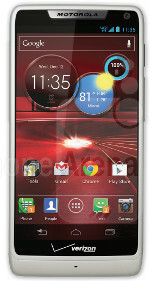 Announced in September 2012, the Motorola Droid Razr M is available exclusively on Verizon in the US. The handset features an edge-to-edge 4.3-inch display, 1.5GHz dual-core Snapdragon processor, 1GB ram, and NFC and ships with Android 4.0. An upgrade to Android 4.1 is now available. An externally similar device, the Droid Razr i, is available in Europe but is based on an Intel chipset rather than the Qualcomm processor used in the Razr M.
Learn more at Motorola’s Droid Razr M page.